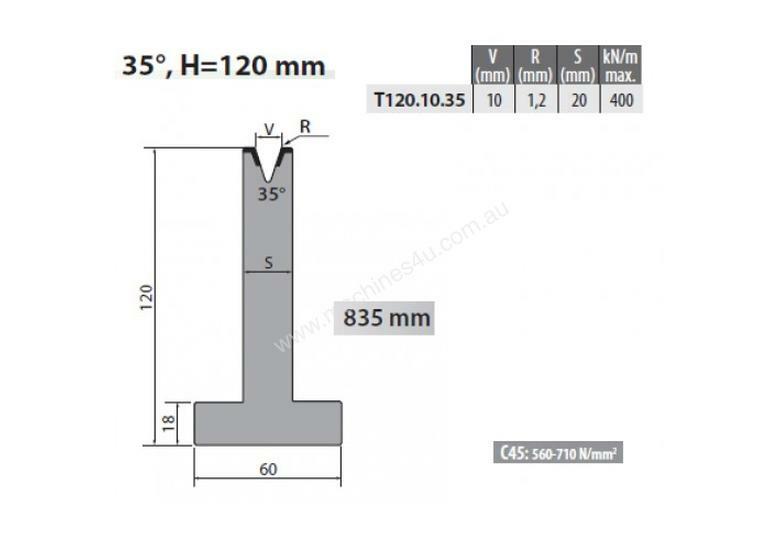 Precision and quality result is what the T Rolleri Single Vee Die 10mm Vee 35 Degree 120mm H offers during sheet metal fabrication. It is built from highly-tempered steel for durability and modernized design for demanding applications. Capital Machinery offers different types of precision tooling. We have the multi-vee dies, gooseneck top tool, radius top tool and more. Capital Machinery was founded in 2003 and is 100% Australian Owned. We provide quality new and used machinery for the commercial steel working and industrial manufacturing industries. We sell a wide variety of machinery and parts from quality manufacturers. Because we provide after sales support and repair, we take great care to select machinery that is cost effective, powerful and will last for many years to come.